EDEN, an Irish artist who produces ethereal, techno tracks accompanied by deep and soulful vocals, transformed the stage at Boston’s House of Blues on Monday with his unique use of lighting and effects that were synchronized with the sounds he created. 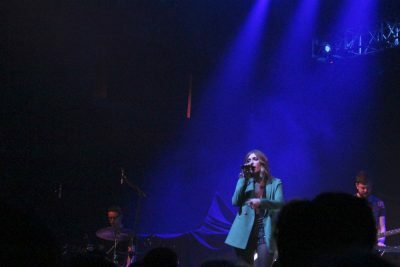 Vérité, a Brooklyn-based artist with a pop-EDM vibe and killer vocals, opened the show. In addition to her own keyboard, she was accompanied by a drummer and an electric guitarist. Though at first she seemed like just another pop singer with a shaky voice producing audience-pleasing bops, her vocals, as well as her stage presence, improved as the set went on. She showed off her vocal riffs in one of her more popular tracks off the 2017 album, “Somewhere in Between,” titled “Nothing.” This song was a crowd-pleaser, as it was a bit more uptempo than her earlier songs, sounding like the kind of song you’d want to hear at the happy ending of a romantic comedy (who doesn’t love those songs?). Her most memorable performance was a cover of The 1975’s “Somebody Else” off of their album “I like it when you sleep, for you are so beautiful yet so unaware of it.” She released her own version of the song as a single in 2016. The delicate femininity of her voice, along with the increased pace and ‘80s-esque twist, gave a fresh take on the original, more serene version of the song. Though she didn’t interact with the audience much, her stage presence was good enough to not let that diminish the performance. Upon EDEN’s entrance on stage, the speakers started blasting an intense reverberation to increase the anticipation and drama for his first song. Though this kind of melodramatic intro is usually kind of tacky and overdone, the way EDEN utilized stage effects saved the intro. There were no spotlights or strong lights to show the audience what the musicians were doing on stage. Instead, it seemed as though the point was to drown the musicians in cool stage effects and an abundance of fog, so that the audience could focus on the music. EDEN’s sound is highly electronic, with auto-tuning and disruptive (but intentional) computer-like inflections intermingled with strings and percussion. The result of these sounds, combined with EDEN’s deep and soulful vocals, is an ethereal experience that this generation of new EDM musicians seems to be perfecting. It was almost like stepping onto another planet, due to the liquid aberrations of the beats mixed with the crazy light shows. After the first few songs, EDEN introduced himself to the audience, admitting that the House of Blues was the biggest venue he’d ever played. This bashful confession revealed his humility, gratefulness and perhaps even shyness. Though the lack of direct lighting throughout the show was likely for the emphasis of the musical production, it’s possible that is also has something to do with the artist’s discomfort at being in the spotlight. The only songs he performed off of his first studio album from 2016, “i think you think too much of me,” were “Fumes” and “rock + roll,” which particularly stuck out for the soulful use of electric guitar. It was refreshing to hear more of the guitar in this track, as the majority of the other songs were so techno-heavy. EDEN ended the set with “falling in reverse,” which was a somber but relaxing way to finish the night. EDEN’s concerts are certainly not a party, with slow, ethereal vibes coming from each of his tracks. But the overall presence and production, especially with the unique lighting and special effects, made his performance one to remember. This review was very inviting and well written! It really made me curious about the music and I will now listen online. Incredible journalism for a freshman!! Keep up the good work, Hannah!! Sky’s the limit!! !